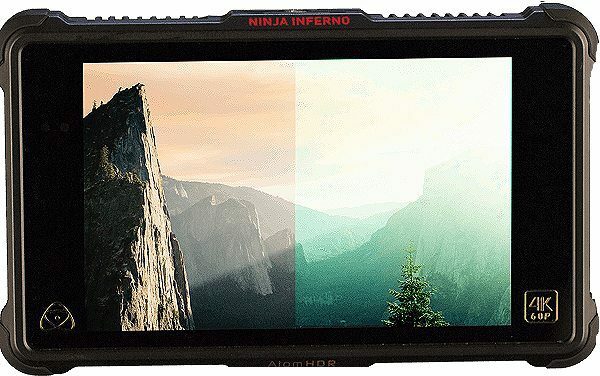 The Atomos Ninja Inferno is specifically designed to overcome the shortcoming of 4Kp60 10-bit professional cameras. This it does by inducing the camera sensor to maximize dynamic range, color resolution and accuracy. Ninja Inferno is still a HDR recorder that is capable of 4:2:2 10-bit recording in Apple ProRes, Log and Avid DNxHR. ProRes and DNxHR are inbuilt recording modes that produce high-resolution recordings ready for editing. 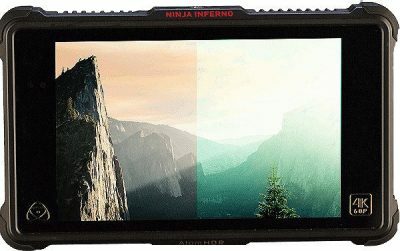 Atomos Ninja Inferno 7” 1900 x 1200 resolution and 1500 nit brightness display device work as a HDR grading monitor since it can receive a HLG or PQ signal from a computer. Hardware is up to standards with HDMI output, 8 channels support, a 48V XLR cable, and a dual battery system with DC power support. AtomHDR engine is used to produce the best color and brightness combination for photos and video. Compatible with Panasonic, Sony, Nikon and Canon cameras, the Atomos Ninja Inferno supports auto HDMI start for these models. The XLR microphones are important because they can be used to boost the audio recording range of DSLR cameras. Editing audio is a breeze because all you have to do to pick the channel for monitoring and use the meters and adjusters to control gain and frame control.